The enormous, palatial Schaumberg Renaissance Hotel and Convention Center played host to this year’s fully resurrected Audio eXPO North America. Boasting over 165 listening rooms, with another 125 exhibits on site, and with attendance up 21% from 2017 (5718 unique visitors and 8134 tickets sold), this show has clearly announced its intent to be both the biggest and most important high-end audio show on the North American continent. Located in Schaumburg, Illinois, at I-90 and Meacham Rd., just a 15-minute commute from O’Hare International, this 500-room hotel has vast, sweeping entryways and enormous open spaces, including an atrium through the first 7 floors of the hotel. In this new venue, this show has become so sizeable that it simply cannot be adequately recounted over its three-day life cycle. And while there seemed to be a midbass emphasis plaguing the entire venue, save for the largest rooms, overall sonic performance was remarkably good. Denmark’s Vitus Audio introduced the RI 101 ($18,360), its new reference 300Wpc Class AB integrated amplifier with built in DAC. The Reference RI 101 has a complete redesign of the output boards and power supply, a completely new preamplifier stage, and the same stepped volume control as Vitus’ Signature SL 103 and Masterpiece MP-L201 linestages. It supports digital files up to DSD128 via the USB input. Driven by the Vitus SCD-025mk.II CD Player ($25,200), sitting on Raidho equipment stands ($1700/ea. ), driving MBL 120 loudspeakers ($21,500/pr. ), and connected with Ansuz Acoustic cables ($80,000), this system was lively, with full and expansive bloom, exceptional midrange clarity, and tangible texture. Strings were vibrant and liquid yet well detailed. Stage height was slightly diminished, and somewhat shallow, but this almost certainly was due to the limitations of the smallish room. In an attempt to deliver the features and capabilities of the remarkable U-300, yet at a more accessible price point, Aavik featured the new U-150 integrated amplifier. This powerful Danish integrated, with 300Wpc, is remarkably versatile. 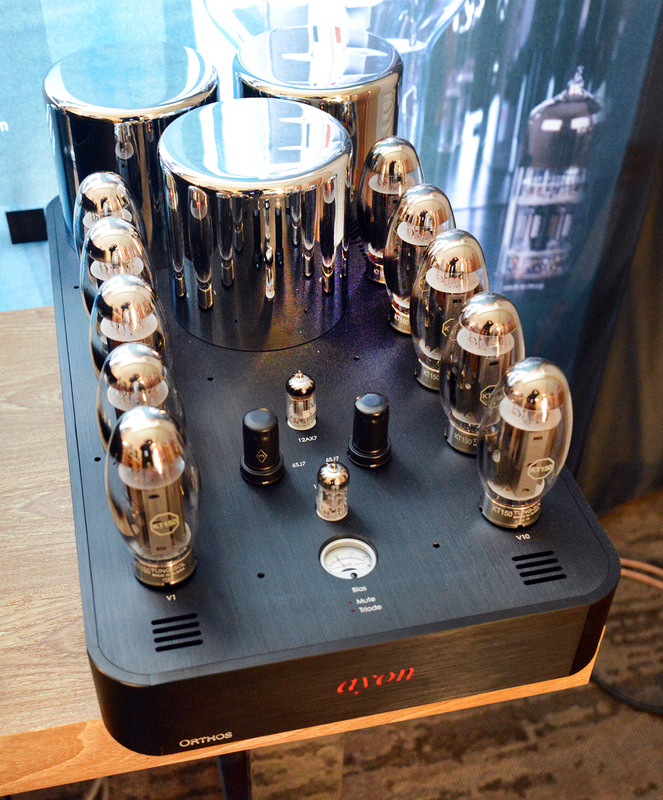 It can be purchased in its base configuration for $12,000 as a pure integrated amplifier. But it can also be ordered (or updated after purchase) with either an mc phonostage ($4200), and/or a DSD, PCM, MQA DAC, (also $4200). The full system used a Naim CDX2 CD Transport ($7495) to drive a pair of Raidho D1.1s, in captivating Lamborghini Green, sitting on matching Raidho Suspension Stands ($32,650), connected with D2 series Ansuz cables. Tone color and texture were simply superb, with surprising low-frequency extension (yes, someone asked, “Where is the sub?”), and macrodynamics. Microdynamic expression and transparency were off the chart, and the system exhibited exceptional layering and depth, as well as conveying an amazingly accurate sense of musical scale. MBL always has a fun room, and this year was certainly no different. 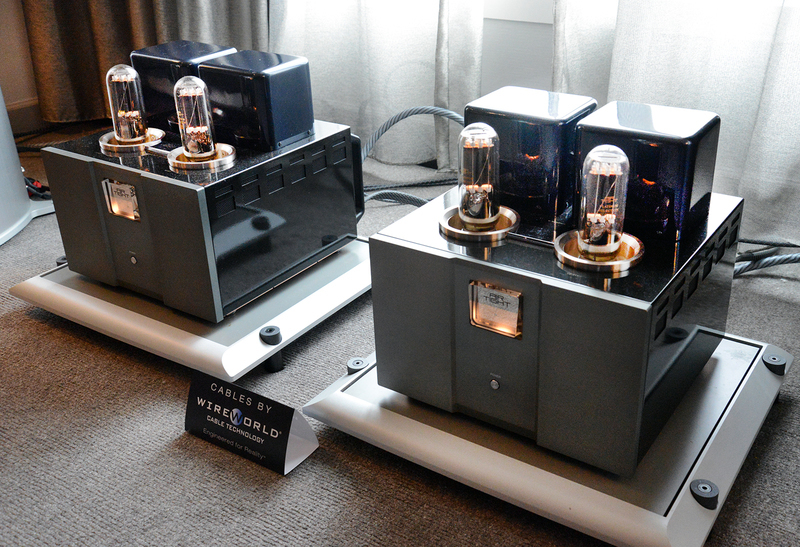 With many new products introduced, the beautiful and authoritative Noble MBL N15 Mono power amplifiers ($17,800/ea.) were given centerstage, biamplifying a pair of MBL 101 E MK II Radialstrahler loudspeakers. Incorporating LASA 2.0 amplifier topology, an MBL-developed technology that combines the advantages of different amplifier concepts, with two XLR inputs and one XLR pass-through (for daisy-chaining), developing 560 watts into 4 ohms at 36 Amps of peak output current, these amps were as powerful looking as they were sounding. Air Tight introduced some seriously engaging products, including a set of amplifiers that announced the achievement of a long-standing goal, the ATM-3211 ($70,000/pr.). Developed over more than five years, these Japanese mono amplifiers achieve 120 watt output from their unique 211 triode push-pull circuitry, blending the grace and delicate tonal qualities of the traditional 211 sound with much higher output. The results with Air Tight’s new ATE-3011 phonostage (TBA) and ATC-5 linestage ($9500), were seductive, controlled, and vibrant. 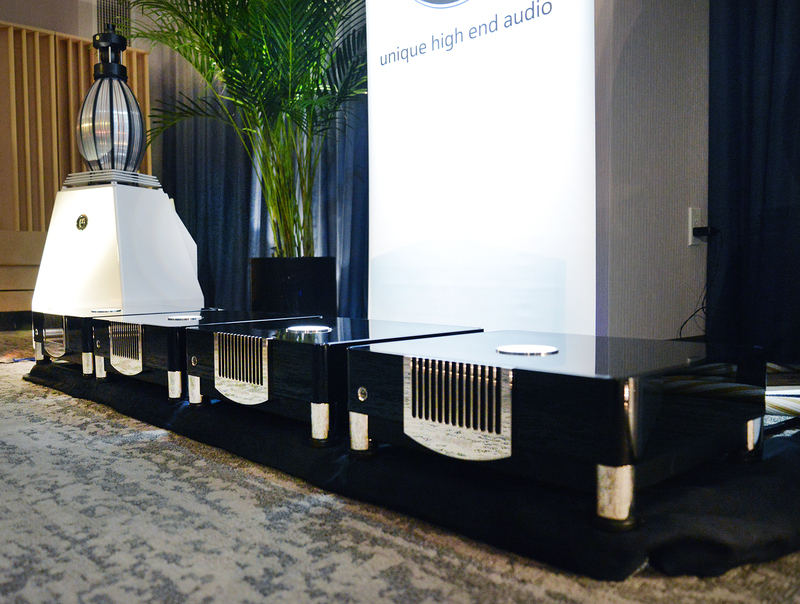 Having come directly to AXPONA from my listening room, Audionet presented the new Scientist Series Stern linestage ($45,000) and Heisenberg monoblock amplifiers ($105,000/pr.) to the public for the first time (full review coming soon). Handmade in Berlin, beyond their benchmark-setting performance, these electronics boast beautiful industrial design conceived by German designer Hartmut Esslinger. The Stern earned a National Design Award and is now on exhibit in the Smithsonian's National Gallery, while the Heisenberg’s were granted a global patent on their floating panels that allow for ventilation and light. Using the Kronos Limited Edition turntable ($48,000), with SCPS 1 power supply ($13,500), Black Beauty tonearm ($10,000), an Air Tight Opus 1 cartridge ($15,000), the Audionet PAM G2 phonostage ($10,100), with EPX power supply ($10,100), driving the YG Acoustics Sonja XV, Jr. loudspeakers ($189,600), and using all Kubala Sosna Realization series cables, this room was a show-stopper! This system’s ability to generate a life-like listening experience is virtually unmatched in my experience. Celebrating its 50th anniversary, the UK’s Cambridge Audio introduced several new “Edge” products, all named for one of Cambridge’s original founders, Professor Gordon Edge. This included its highest-performing power amplifier to date, the Edge W ($3000), developing 100Wpc and using just 14 hand-picked components in the entire signal path. A matching Edge NQ preamplifier/network player ($4000), driving B&W 805 D3s ($6000), all connected with Nordost Frey2 interconnects and speaker cables, made for some seriously engaging music. This seductive little system offered a full presentation with wonderfully expansive depth, very good texture, remarkable detail, and nicely focused, individual voices. Expanding on the original and highly successful Sprout, PS Audio introduced the next-generation Sprout100 for the first time anywhere, playing through ELAC B6 speakers. 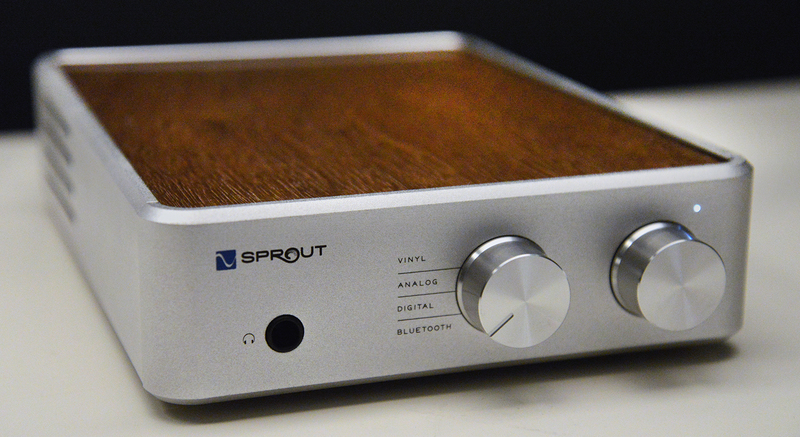 The Sprout100 ($599) has double the power of the original, 100Wpc into 4 ohms, and a host of new features including a remote control, improved Bluetooth, a DAC that decodes up to DSD128, and defeatable bass boost, with the same size and styling. Andrew Jones was showing off an abundantly featured integrated amplifier, the ELAC EA102W-G ($700). Boasting a BASH Digital Fidelity Tracking Amplifier (80Wpc into 4 ohms/ 40 into 8 ohms, with a response of 20Hz to 40kHz), it offers two analog inputs, two digital inputs (one optical and one coaxial [192kHz 24-bit]), L/R pre-outs, and a sub out, as well as the speaker outputs. With an RJ45 network jack, multi-band WiFi, and Bluetooth with aptX, it streams RoonReady, DiscoveryReady, Spotify Connect, and AirPlay, has Dolby Digital, and can be controlled by your iOS or Android device. But most amazingly, its native Room EQ tool negates the need to use a calibrated mic, allowing you to effectively use the non-calibrated mic in your phone to quickly configure and use the system with any speaker system you pair it with. This whole system, when paired with the equally overachieving $300 ELAC DB-62 speakers, was under a grand! Yet when playing back 88 Basie Street, using ELAC’s own $70 speaker cable with banana terminations, it sounded as if we were listening to a set of competent separates playing through floorstanders! Staggering performance for the money. 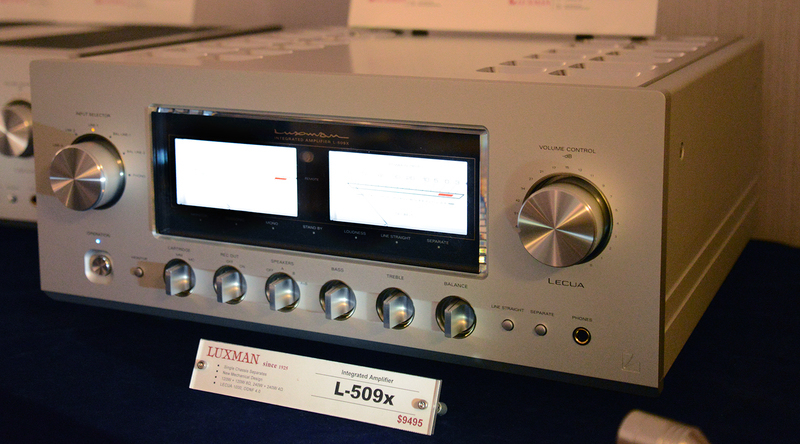 Luxman showed a new L-509x ($9495) integrated amplifier, which combines elegant styling with the sonic advantages of Luxman’s lineup of separates. It also adds Luxman’s new LECUA 1000 computerized attenuator, an 88-step amplifier circuit developed for the C-900u linestage, ODNF (Only Distortion Negative Feedback) v4.0, a proprietary feedback circuit featuring a high-speed primary slew rate, an ultra-wide bandwidth, and a low level of distortion that is achieved by feeding back only the distorted components of the audio signal from the output of the amplification circuit, and a power supply with independent left and right channel blocking capacitors, producing 120 watts per channel. 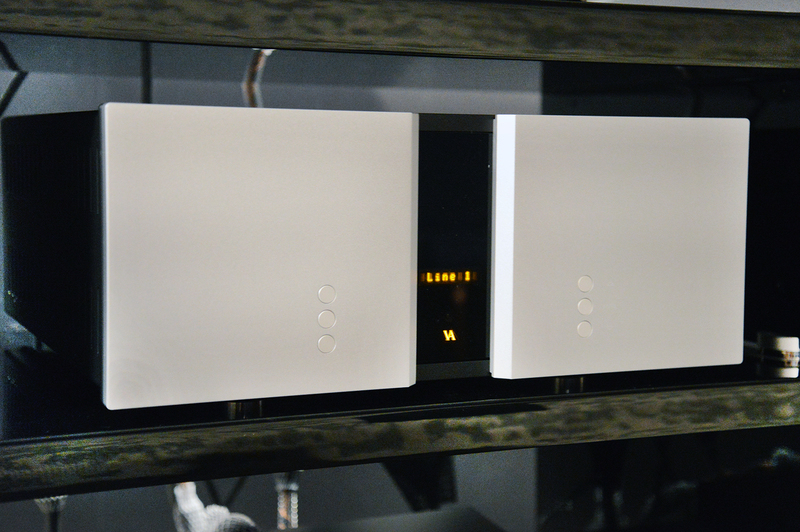 Austria’s Ayon Audio introduced the Orthos XS monoblock power amplifiers ($28,000/pr.). This is Ayon’s third-generation KT150-based mono power amplifier, which offers true balanced or single-ended operation, and delivers 300 watts per channel in pure Class A pentode mode, with zero dB of negative feedback. All the gain stages and power stages were redesigned to achieve the shortest signal path and the most direct signal flow. There is no denying that the new Technics SE-R1 digital basic power amplifier ($17,000), looks as clean and powerful as it sounds. Technics has a unique approach to addressing digital amplification, employing its JENO Engine (Jitter Elimination and Noise-shaping Optimization), GaN-FET Driver (high-speed and low-impedance power devices), LAPC (Load Adaptive Phase Calibration), Technics Digital Link (Original Digital Signal Transmission), high-speed silent linear power supply, battery-driven clock generator, dual-mono construction, all housed in a high rigidity metal double chassis. When the SE-R1 is paired with the SU-R1 network player ($9000), either the SP-1000R ($18,000) or SP-10R turntable ($10,000), and the SB-R1E speakers ($27,000/pr. ), Technics has taken a giant leap to the fore in digital amplification. California’s Aesthetix announced the merging its Calypso linestage and Atlas power amplifier into the Mimas integrated amplifier ($7000). Employing zero feedback and low-flux custom-wound transformers, it features the differential balanced-bridged outputs found in the Atlas and the discrete switched-resistor volume control of the Calypso. As a hybrid, it uses a bipolar output stage, bipolar driver stage, and a 6DJB/6922 tube gain stage per channel, and offers five inputs, both balanced and single-ended. Then, pick à la carte a DAC ($1000), a phonostage ($1000), or both! 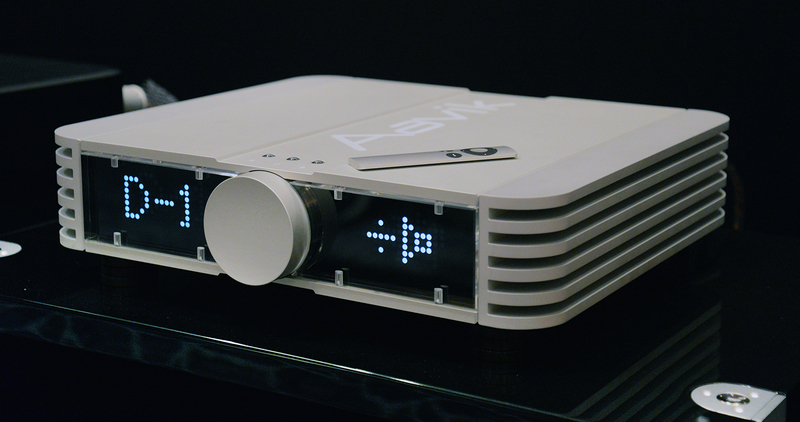 Aesthetix even offers a phono headphone update (1 Watt, 32 ohms, fully discrete Class A) for another $500! Musical Fidelity introduced the new M8 Series Encore 500 streaming music system ($7999), its most earnest effort to date at a complete, all-in-one music solution. Featuring trickle-down technology from the retired flagship Titan amplifier, the M8 Encore 500 strives to provide the same stellar power (500Wpc) and performance levels of its reference gear, while accepting virtually any conceivable analog or digital audio source. The Encore uses a 64-bit Intel CPU with 2GB of RAM, has a large full color display, is controllable from its own IR remote or Android or iOS apps, and boasts a huge range of facilities: three analog inputs, four digital inputs, four USB A connections (one of which has high current capacity for charging phones and tablets), network connectivity, high-quality variable line-level outputs as well as a digital output, includes a CD player, and a 2TB hard disk drive for storage. Beside driving your choice of passive loudspeakers directly, it is also compatible with many network speakers. Georgia’s The Audio Company room, sourced by Kronos/Air Tight or Esoteric, all VAC Statement electronics, using Von Schweikert Audio Ultra 11 loudspeakers, cabled with MasterBuilt Ultra simply took my breath away in after-hours listening sessions. Hands down, Andrew Jones’ ELAC products, the $700 EA102W-G integrated hitched to Elac’s $300 DB-62 speakers with its $70 speaker cables, pulled off the biggest overachievement at this event. The Audionet Scientist Series, the Stern linestage and Heisenberg monoblocks. Their transparency, resolution, control, and scale, combined with their portrayal of body, bloom, texture, color, and air set new benchmarks. The rampant growth of all-in-one, integrated, streaming music systems. 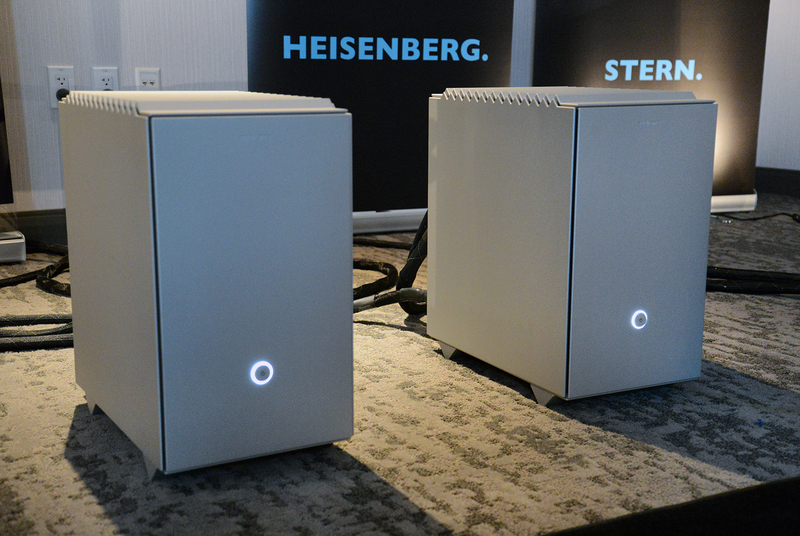 The Audionet Stern linestage and Heisenberg monoblocks.